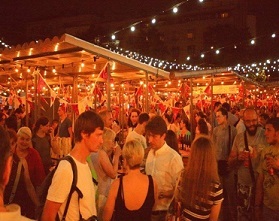 The farmers’ market in Palilula is the largest investment of the PUC Belgrade City Markets. It encompasses construction of the cutting-edge market in Southeast Europe. For the first time, in the design phase, the technology of the market was used as the basis of the project development. The natural terrain slope allows the multi-level facilities equipped with all logistic and technical facilities necessary for the functioning of both the individual shops and the facility as a whole. Project description: The 12,681 sqm farmers’ market in Palilula shall consist of four levels. The market plateau will have functionally separate zones for the sale of agricultural and non-food products, designed as an open space with freestanding modular boxes. The floors below the plateau are envisaged for the logistics, supply, loading ramps, warehouses, spaces for product preparation and waste disposal, and the parking spaces for leaseholders and visitors. An additional retail space will be placed within the market, primarily intended for the sale of Serbian souvenirs, handicrafts and antiques. Specificity of the idea – a market should be a tourist attraction of the city, as a brand, it should be represented throughout the facility, emphasized as its specificity for the respective location, therefore façade materialization is planned to be executed in this spirit. The survived written records from the 17th century indicate the fact that peasants delivered groceries to the home addresses of the inhabitants of Zemun. The sale of fresh river fish caught by the Danube fishermen is what has always distinguished this market. To this day, it remained the place where all Belgraders come to buy fresh river fish. Nowadays, the Zemun market is located at the Masaryk Square [Masarikov trg] and Omladinski Square [Omladinski trg], with Gospodska Street dividing the market in two segments. As of June 2012, Omladinski Square has been refurbished to a multifunctional plateau for the first mobile market in the region. The mobile market is equipped with 45 mobile stalls with umbrellas, and 353 stalls and 40 cooling display cases are placed at the Masaryk Square. In 2017, the entire Masaryk Square was paved with granite slabs. The market complex has been visually and functionally transformed without disturbing the traditional role of the market in the sociological, historical and cultural sense. 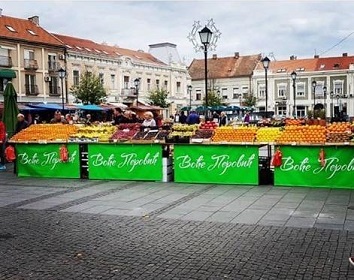 The importance of the Zemun market for the development of the capital's tourist offer is best described by the visit of the BBC Travel television crew who stayed in Belgrade in the summer of 2016. The television crew recorded sights and symbols of the city: historical monuments, restaurants, squares, and when they visited Zemun, the farmers’ market was one of the sites they included. Wholesale Market represents a special market institution of the wide range trade, primarily in domain of agricultural and food, and the other accompanying products as well. It is a key link in the food provision chain on the territory of Belgrade and Serbia, but also a place of networking, contracting and export-import realisation. Belgrade Wholesale Market is a significant project with a vast potential – it offers a joint market appearance of the producers, an unified product offer, sufficient continual quantities and consequently, a predictability in doing business for persons that acquire their goods at the Belgrade Wholesale Market. Belgrade Wholesale Market, with the efforts of municipal and republic authorities is developing the project NATIONAL WHOLESALE MARKET as a wholesale trading system. In the area of almost 20 ha, and diverse sales capacities, the activities of Belgrade Wholesale Market service beneficiaries are taking place. At the plateau of 7 ha surface there’s been a selling activity from the vehicles, under the open sky, of fruits and vegetables and other agricultural products - on 760 selling places and 75 vendor booths. 20 modular objects per 20m² reserved for the selling of confectionery have been especially set up. In the closed object of the administartive building there’s been more than 7.500 m² of commercial space - 26 shops, 42 offices i 52 storages. Local Customs branch of the Belgrade Customs Department has been set up in the administrative building, and there’s been more than 20 forwarding agents doing business in these premises. In order to support the functioning of these activities, parking terminal for heavy-duty trucks has been opened at the Belgrade Wholesale Market. Newly built hall of 10.400m² area has welcomed lessees who are trading fruits, vegetables, food products and mixed goods. Constructed by applying the highest standards, it also contains a space designated for the phytosanitary check of the products for the export to the Russian Federation – conducted by the inspectors of the Ministry of agriculture, forestry and water management. Wholesale Market has been supplying the market of over 3 million inhabitants and is visited each day by 2.000 buyers. A vendor on this location introduces to the market from 2 to 1.000 tons of goods, depending of its production scale. Belgrade Wholesale Market as a responsible company is periodically organising a series of gatherings between vendors and professional agricultural advisory departments, as well as the other subjects whose business is at least partly related to the agriculture, and serves to its maintenance, development and improvement. Belgrade Wholesale Market is located at the excellent traffic and logistics position that is equally accessible to all the suppliers, importers and buyers. The Wholesale Market is both infrastructural and market institution of a large consumer center, that is exercising a key influence on quality and final price of, in the first place, easily contaminated products that are highly important for the provision of millions of inhabitants. Traditionaly organised as the open air event in the evening. Attracting each time over 20,000 visitors of all generations. Idea of reviving the market in the late evening hours. 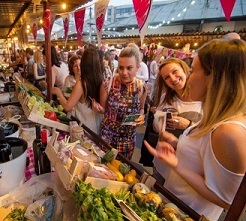 This year during the WUWM Conference 'Love Your Local Market' International Celebration event will take place at the Belgrade Night Market on Thursday evening, May 16th.